St. Patrick’s is around the corner! 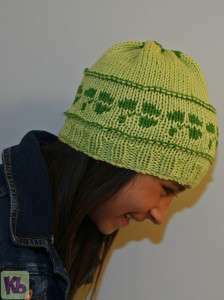 Wip out this lucky shamrock beanie for one of your loved ones or for yourself. The stitch pattern is an 8 stitch repeat, making it an easy stitch pattern to use on smaller or bigger hats, or other projects in the round. An awesome unisex design. Want a slouchy style instead of a tight fitting beanie? Work more rounds in the italicized section in the pattern. 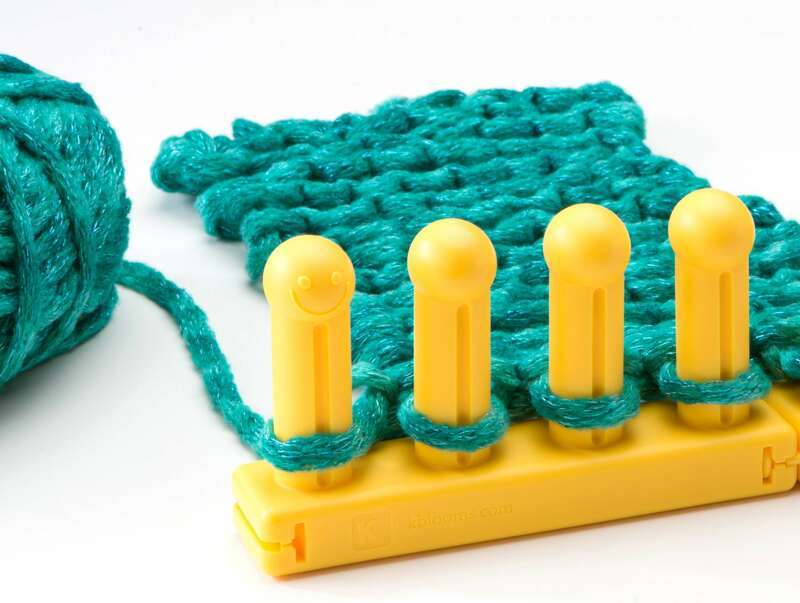 Knitting Loom: All-n-One knitting loom, set at 72 pegs (or any configuration of multiple of 8). Yarn: Approx 140 yards of worsted weight yarn. Sample was knit using Knit Picks in Citrine (MC) and Macaw (CC). Size: Size shown fits up to a 19.5″ head. To create smaller or larger sizes, simply cast on a number that is a multiple of 8 (56, 64, 72, 80). K: knit stitch. 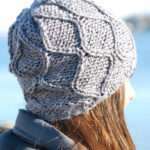 Recommend the knit stitch or the u-stitch; do not recommend the flat stitch or the ewrap. CO: cast on (Sample uses the ewrap cast on to provide an elastic fit). K2tog: knit two stitches together. A right slanting decrease. When working with two strands of yarn on the same row, be sure to pick up the yarns in the same order throughout the project. View this video for a few tips on working with colorwork. 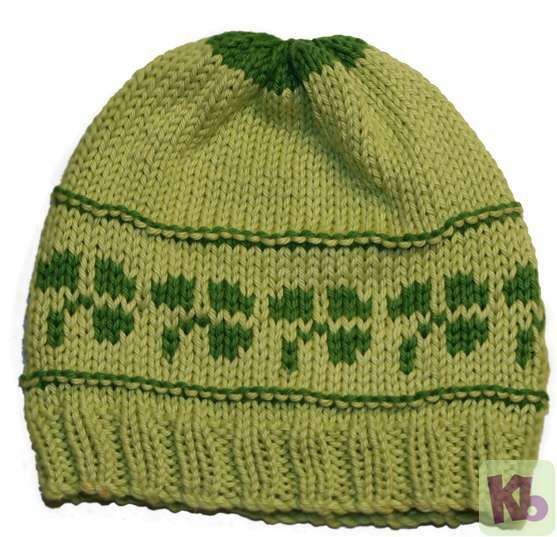 Work your colorwork loosely, if you pull on the yarn too tight, the knitted fabric will pucker up. Wet block or steam block after knitting. Work chart from the bottom up, and every round starts on the right. Set up the All-n-One loom to 72 pegs (or any other multiple of 8 stitches). Using MC, cast on 72 stitches, prepare to work in the round. Rnd 1-8: *k2, p2; rep from * to the end of rnd. Rnd 9-11: k to the end of rnd. Rnd 12: Join CC, k to the end of rnd. Rnd 13: PU, MC, p to the end of rnd. Rnd 14-16: Cont with MC, k to the end of rnd. Rnd 17-24: Follow chart to create the shamrocks. Rnd 25-28: With MC, k to the end of rnd. Rnd 29: PU CC, p to the end of rnd. Cut CC leaving a 6 inch yarn tail. Rnd 30-50: With MC, k to the end of rnd. Cut MC, leaving a 6 inch yarn tail. Rnd 51-54: k to the end of rnd. Rnd 55: *k2tog; rep from * to the end of rnd. Move the stitches from the odd numbered pegs to the even numbered pegs. Knit the round, skipping the pegs with no stitches and treating the pegs with two loops as one loop. Remove stitches from the loop to a piece of scrap yarn—this is temporary. Readjust the knitting loom to the new peg number configuration: 36 pegs. (Divide the cast on number of pegs by 2). Place the stitches back on the knitting loom. Gently tug on each of the stitches, starting with the first peg, to remove any of the extra slack in the yarn. Rnd 56: Rep Rnd 55. Bind off with the gather removal method. Cut yarn leaving a 6 inch yarn tail. Steam block or wet block to set the stitches. I really like this pattern. I would like to download this pattern. Will that be available anytime soon? thanks so much for sharing – ST. PATRICKS DAY is my birthday so yes I will be making one of thiese………………. On round 25-28 did you mean MC? Download? You mean as a PDF. They are put in PDF format after being on the blog for six months. In the meantime, you can copy it and paste it onto a word document and save it that way. Isela what a clever pattern. I’m so glad to see you still posting patterns. I started loom knitting 2 years ago, I was quite late to the party, but I learned sooooo much from your videos.You’re a fantastic teacher. Well, learning to read patterns is a bit like learning to read. Each pattern comes with a list of abbreviations. I guess the first step is to learn the abbreviations and what they mean. Next, start reading the pattern, if needed, replace the abbreviation with the complete term. In pattern writing, it is best to be concise, however, if you prefer, you can use the entire term, if it makes it easier to understand. Once you get to the pattern itself. A number next to a letter or term typically means that you work that many stitches (the number). 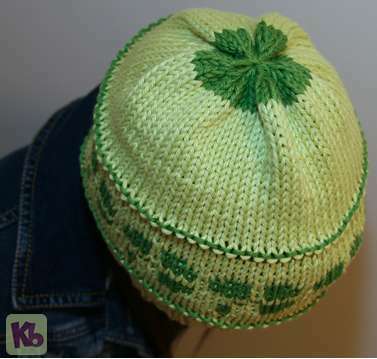 Example: k2=knit two stitches (knit two pegs). Another example: Sl 3=slip 3 stitches (skip 3 stitches with yarn behind the pegs). Does this help a little? I do not know any other way to reach you. May I please have some info on 2 projects On the AIO headband with crochet flower, I tried to use a #4 weight 100% wool. I was into the pattern and looked at it on the right side, the stitches were large. Your picture showed a tiny row of stitches. What did I do wrong? next? on the cats paw headband what yarn did you use? what weight? color? The one with the crochet flower: I just worked the knit stitch. Nothing different or fancy. My tension is the same throughout. 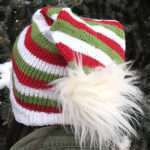 Cats Paw Headband: it looks like Knit Picks Shine in worsted weight. Don’t have the color way written anywhere. It was yarn left over from another project.